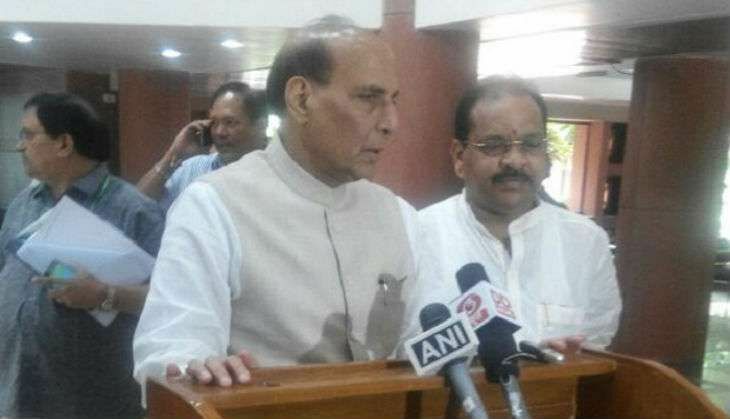 On 5 September, Union Home Minister Rajnath Singh expressed his dissatisfaction with the separatists move to reject the offer of talks. Singh alleged that the separatist leaders don't believe in "insaniyat, Kashmiriyat, jamuriyat". He said that the doors are always open for those keen on holding a dialogue to restore normalcy in the region. Singh said the Centre as well as the all-party delegation is extremely serious and concerned about restoring normalcy to the Valley at the earliest. "There are no two ways about the fact that Jammu and Kashmir is a part of India, was a part of India and will be a part of India," Singh said while addressing media in Srinagar. "If someone goes to talk and they (separatists) don't talk, then they clearly don't believe in 'insaniyat, Kashmiriyat, jamuriyat'," Singh said. "Some members of the delegation met Hurriyat leaders and that the government neither approved nor disapproved of the same. 'Baat-cheet kay liye hamara darwaaza hi nahin, hamara roshandaan bhi khulaa hai'," he said. Commenting on the use of pellet guns by the paramilitary forces, the Home Minister said the government has given an alternative to pellet guns - Pelargonic Acid Vanillyl Amide (PAVA) - which will be used within a period of two months. PAVA shells, a chilli-based ammunition, is less lethal and immobilises the target temporarily. The all-party delegation, headed by the Home Minister, on Sunday held parleys with various sections of the society and listened to their concerns as part of efforts to find a common solution to the current unrest.